That boosted my morale quite a bit and I decided to expand my cheese realm. By that, I meant replicating the dish with fish, instead of chicken. 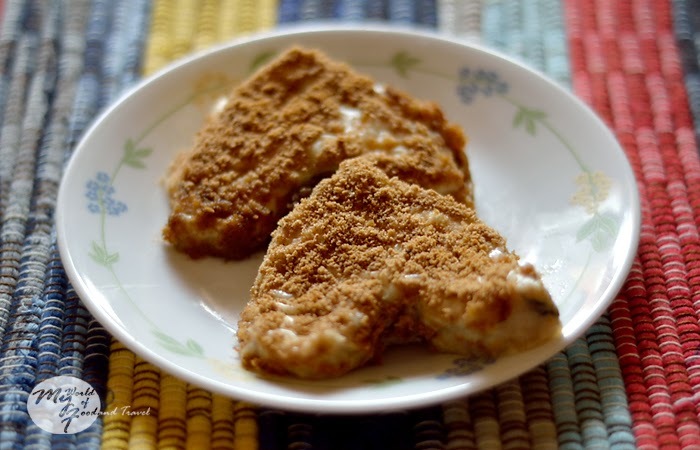 I saw a similar recipe in Priyadarshini’s blog and the idea of using breadcrumbs came from her. I first made it for my cousin and sis-in-law for a ‘farewell dinner’ just before they were about to leave the country for US. They had arrived unexpectedly early. R, my cousin, is not exactly known for his punctuality. But then, an honest confession (“we had nothing else to do, we sold our TV, so decided to come early”) and I had to hustle and hurry! I was really, really worried about how my dish would turn up and although it did seem a bit shaky, they seemed to enjoy it. And hence, I am adding this recipe to my cheese repertoire. Here, take a look, and please feel free to add your own twists and condiments. First, let’s make the cheese sauce. In a pan, sizzle up the butter and add the spoonful of flour, whisking it furiously so that no lumps are formed. Now, pour in the milk in batches and keep on stirring. Next, add the grated cheese and stir till they melt and thicken up the sauce. Add salt and pepper to taste. Take the sauce off the gas. It should not be too thick or too thin. Now, line a baking tray with silver foil paper and glaze it generously with refined oil. 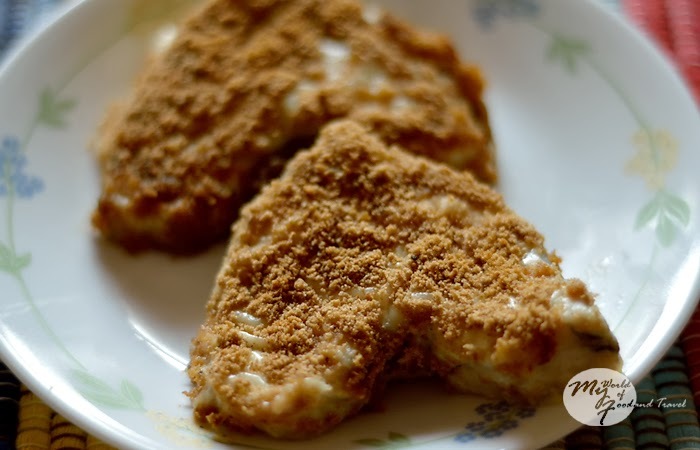 Arrange the marinated fish steaks on the tray and pour the cheese sauce over them. 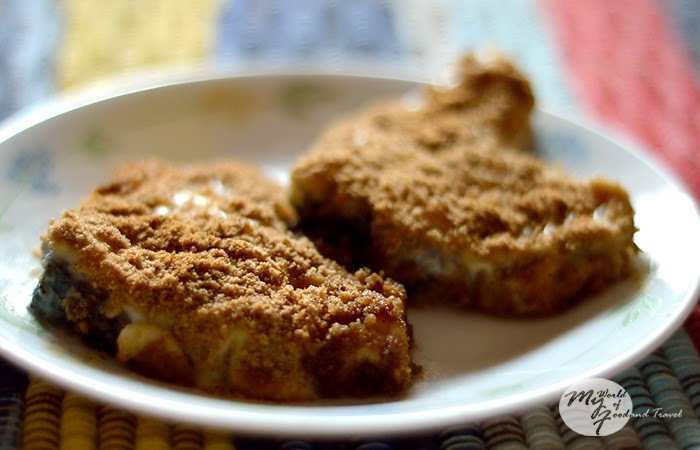 Finally, sprinkle the breadcrumbs over the fish so that the sauce is well covered. You can toss in some more grated cheese over the breadcrumbs as well. I did not, though. Slide in the baking tray in a pre-heated oven at 190 degrees for 10 minutes, in the middle slot. Later, shift the tray to the upper slot for around 4 minutes so that the breadcrumbs crisp up and turn a golden brown crust. There, your delicious, decadent cheese baked fish is ready! Devour it hot with any dish of your choice. It pairs well with herbed, buttered rice. Enjoy this cheesy treat, oozing with melted goodness, and let’s wait for the day when the Doc writes “One cube of cheese, twice daily”! Cheese and fish - yum...slurp...the perfect combo! I have to try this! I am still in a daze, Aditi. That was a surprise I had never even dreamt of! Thank you so much!! Hopped over from Aditi's and am I glad! Nice place you have here. I am so glad you liked my ramblings, Tulika! I will try to be regular with my posts, now....I am far too lazy! We absolutely loved this dish at your place. And you cooked it in no time. Haahah! You guys were my guinea pigs that day...thank god you liked it!